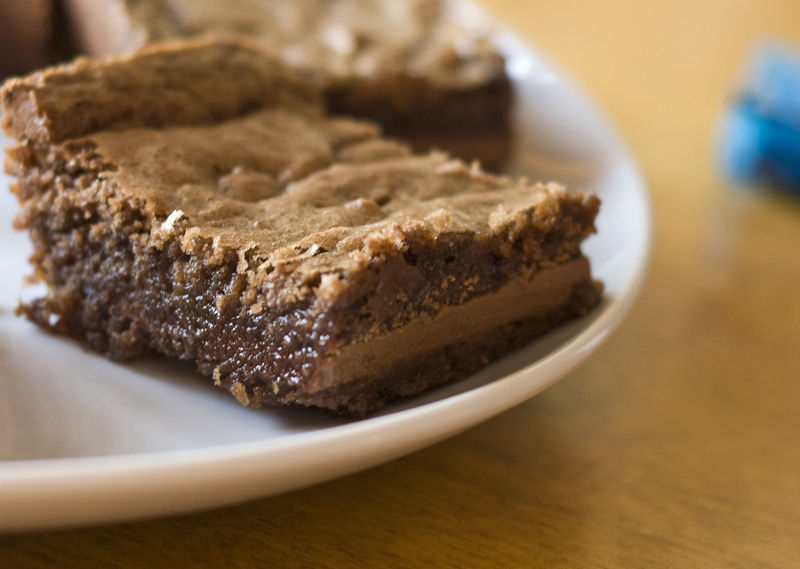 This brownie is for chocoholics everywhere. These brownies are for you! The brownie mix I used (again I made a lot of brownies at one time which is why I used the mix) was Duncan Hines Milk Chocolate Chunk Decadent Brownies. I would have rather used Ghirandelli’s Triple Chocolate Brownie mix from Costco, but didn’t have any on hand. I’m a big fan of Ghirandelli’s 🙂 They are very easy to make, but the layers look like they took longer. If you are wondering what the blue object is in the photo, it took me about 2 seconds to realize it is probably a hot wheels car. We have a few hundred floating around here I think. 1. Preheat oven 325 degrees. Mix together both mixes, oil, eggs and water. 2. Pour half the batter into a 9×13 pan. 3. Place unwrapped Symphony bars on top of the batter. 4. Pour rest of the batter on top of the Symphony bars. 5. Bake 40-45 minutes. Cool completely.